David Sampson, project manager of AECOM Technical Services, which conducted a survey of the town's bus services, details the survey findings projected on a screen for Town Hall forum Monday night. A new study of the town’s public transportation program — recommending a range of possible new service options — determined that although there is support for some kind of bus service among residents, what the future holds will depend on several factors. 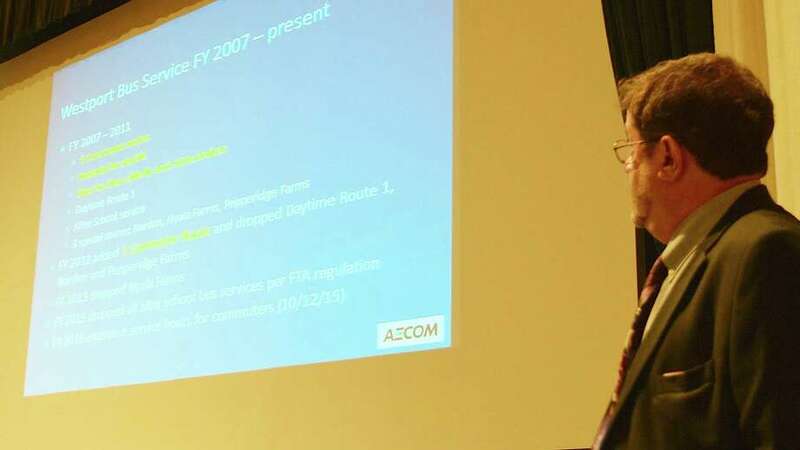 The Westport Bus Operations and Needs Study was presented at a Monday night forum in Town Hall by Dave Sampson, a project manager with AECOM Technical Services, which conducted the survey for the Western Connecticut Council of Governments. If all of the recommendations for expanded service on existing commuter routes, as well as new daytime service, plus capital and marketing costs, were approved and implemented over the coming years, the total price tag would be nearly $900,000, according to the report. “We got a lot of input from riders, from non-riders, from community organizations … We met with the YMCA, we met with the Board of Ed,” Sampson said of the state and federally funded study. “We actually did a lot of outreach to make sure,” he said. Sampson outlined the history of Westport’s service, which began in the 1970s with mini buses that criss-crossed the town — seven routes that traveled between Jesup Green downtown and Staples High School. “As a result that daytime service was extensively used by students … It was ubiquitous. It went everywhere in town,” he said. Because of funding cuts over time, however, ridership fell and management of the local bus system eventually was turned over to the Norwalk Transit District, which operates both the town’s commuter and door-to-door bus services. Sampson detailed several recommendations for upgrading local programs, including expanding service for commuters at local train stations and, at some point in the next couple of years, establishing a “town circulator” bus route operating all day from the Saugatuck station to downtown and the Imperial Avenue parking lot. “Truly it does not appear that there’s a need for fixed service throughout the town … like the old service,” he said, but “there might be some specific needs, niche markets that need to be covered,” including downtown-railroad connections, service to the sites of housing for the elderly, and to popular community institutions like the YMCA and Earthplace. Several dozen officials were in attendance at the meeting and many offered input for the final transportation report. “I think if we could use this report to provide specific guidance for what Westport, the town, should be doing, what the transit district should be doing, and what the Norwalk Transit District should be doing,” said Jennifer Johnson, RTM District 9 and a former co-director of the Westport Transit District. First Selectman Jim Marpe voiced support for tracking technology that could alert residents when arrival of a bus is imminent, calling it one of things he was is excited about. “I think that has a potential to be a game changer,” he said.